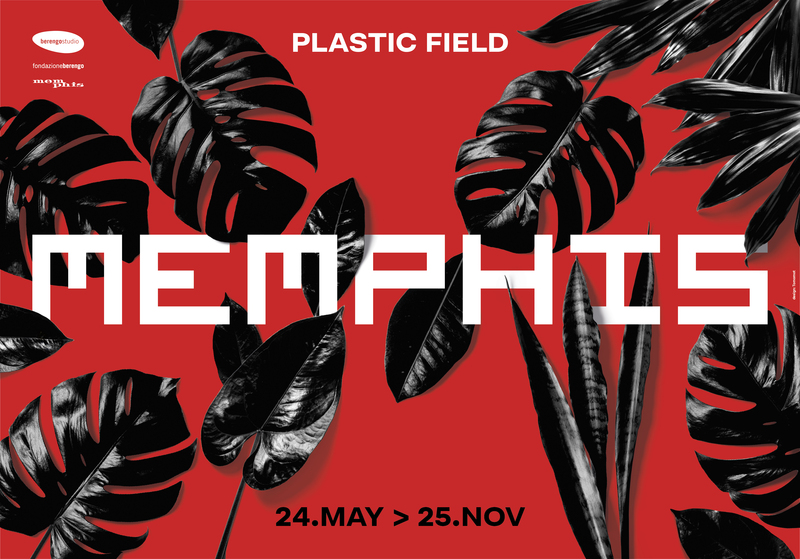 From May 24th to November 25th during the 16th edition of Biennale Architettura, Fondazione Berengo hosted “MEMPHIS – Plastic Field” at Palazzo Franchetti, an exhibition of Memphis group’s design works curated by Jean Blanchaert and Adriano Berengo, friends and collaborators for over fifteen years. Just like in the early ‘80s when the design group challenged the minimalist trend with a multicolored, pop art-inspired style with a provocative soul, this time Memphis’ iconic works stood out in contrast with Palazzo Franchetti’s historical backdrop. As a frame for the exhibition, a field of black leaves and plants was set to fade out any surrounding colour and let the visitors’ attention focus on the bold and daring range of tones and shapes which allowed architect Ettore Sottsass to leave an unforgettable mark in the global design scene of his time, together with the other co-founders of the movement. The exhibition presented a selection of contemporary productions of the group’s most renowned works in their original design created during the 1981-1987 period. Alongside Sottsass’ masterpieces, “Plastic Field” offered the chance for visitors to enjoy the design works signed by Zanini, De Lucchi, Zanuso Jr, Bley, Bedin, Mendini, Mariscal, Kuramata, Cibic, Graves, Iosa Ghini, Thun, Taylor, Umeda, Sowden, Sanchez, Shire, Branzi and Du Pasquier. Memphis’ innate irreverence shone through the exhibition’s structure as well, whose set-up by IB Studio (Milan) reshape Palazzo Franchetti’s map through Carlton’s geometrical skeleton, Sottsass’ 1981 iconic room divider that incarnates the postmodernist soul of his maker. A thematic room is set to celebrate the impactful shapes and chromatic range of Memphis’ glassworks and to express Fondazione Berengo’s commitment in promoting the elegance and versatility of Murano’s glassmaking. Starting from 1989, Berengo Studio offers a top-class furnace for architects, artists and designers for the exploration this exquisite art medium. Thanks to the Glasstress project, the Studio has established itself as a synonym of glasswork for contemporary art. Furthermore, a 24 feet tall golden cage occupied Palazzo Franchetti’s courtyard throughout the exhibition period. “Gilded Cage” by Ai Weiwei is one of the Chinese artist-activist’s newest and most impactful urban installations, appearing last fall in New York’s Central Park as part of the public artwork series titled “Good Fences make Good Neighbors”, conceived as a campaign to raise awareness on the global refugees issue. Ettore Sottsass, Martine Bedin, Thomas Bley, Andrea Branzi, Aldo Cibic, Michele de Lucchi, Nathalie Du Pasquier, Michael Graves, Massimo Iosa Ghini, Shiro Kuramata, Javier Mariscal, Alessandro Mendini, Maria Sanchez, Peter Shire, George Sowden, Gerard Taylor, Matteo Thun, Masanori Umeda, Marco Zanini, Marco Zanuso Jr. Founded by Ettore Sottsass and a group of young architects and designers who worked with him, Memphis group was created as a workshop for the development of new ideas in design. Active from 1981 to 1987, it rapidly became a cultural phenomenon, revolutionizing the global design scene of the time. Società Memphis, owned by Mr. Alberto Bianchi Albrici, still produces the group’s original works.